Janghera, or the Fakeer's Rock, on the Ganges. Drawn from nature by G. F. White, Esq. 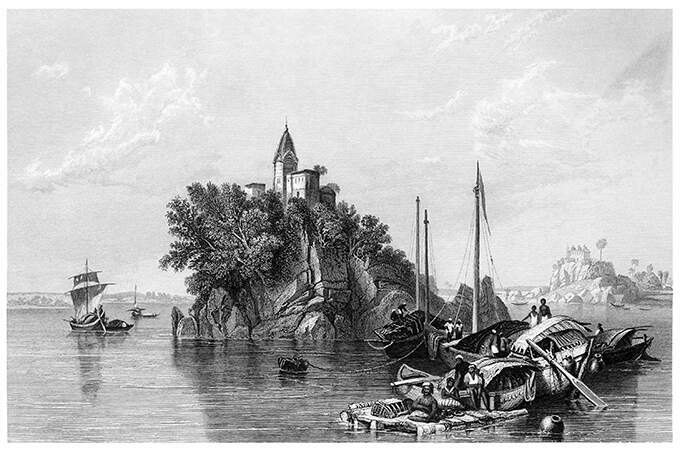 View of a rocky island on the Ganges, topped by a tower and a few buildings, with boats in the foreground. The river Ganges, in its progress through the plains, waters many spots of remarkable beauty; but in the whole course of its brilliant career, it can scarcely boast a more splendid landscape than that in which the rocks of Jahangira form a prominent feature. Standing boldly out in the stream, near a place called Sultanganj, in the province of Bihar (about ninety miles east of Patna), this picturesque pile forms a beautiful object. It consists of several masses of grey granite, heaped one upon the other in an irregular manner, forming ledges and terraces, which have become the sites of numerous small temples. In some places, a crevice in the side of the rock has afforded room for the roots of magnificent trees to shoot upwards, and crown the romantic height with bright foliage.